This time around, though, the band operates with a little more future-facing pride and compulsion. It's a lesson on how to do it yourself, and do it well. Defiance never sounded so good. Why See Metric and Zoe? In support of the summer 2018 release of their brand new album Art Of Doubt, genre-bending stalwarts Metric are teaming up with Latin Grammy Award-winning duo Zoe for a mammoth 27-date tour in the winter of 2019. Fusing an eclectic array of synth pop soundscapes, new wave electronica and danceable rock with killer pop hooks, Metric returns on fine form with a grittier edge. Frontwoman Emily Haines and co still fiercely trailblaze outside of the pressure of zeitgeist trends in the album's culmination of epic, arena-shaking rock anthems. Rising up to take the Spanish-language rock scene by storm during the late 2000s, Mexican guitar-wielding quintet Zoe have gone form strength to strength, really hitting their stride with their chart-topping third album Memo Rex Commander y el Corazon Atomico de la Via Lactea. Deftly blending Latin pop with an old school rock and roll approach to arrangements and production, Zoe are beloved for their insightful lyrics in both English and Spanish, and are a veritable crossover hit with over two decades of fine music-making under their belts. Seen Metric and Zoe? Loved it? Hated it? Sound good to you? 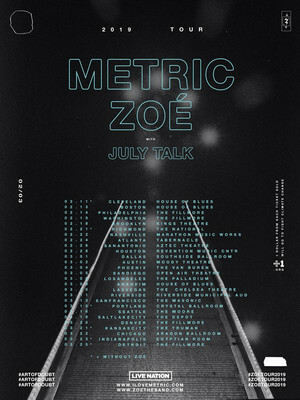 Share this page on social media and let your friends know about Metric and Zoe at Aragon Ballroom. Please note: The term Aragon Ballroom and/or Metric and Zoe as well as all associated graphics, logos, and/or other trademarks, tradenames or copyrights are the property of the Aragon Ballroom and/or Metric and Zoe and are used herein for factual descriptive purposes only. We are in no way associated with or authorized by the Aragon Ballroom and/or Metric and Zoe and neither that entity nor any of its affiliates have licensed or endorsed us to sell tickets, goods and or services in conjunction with their events.